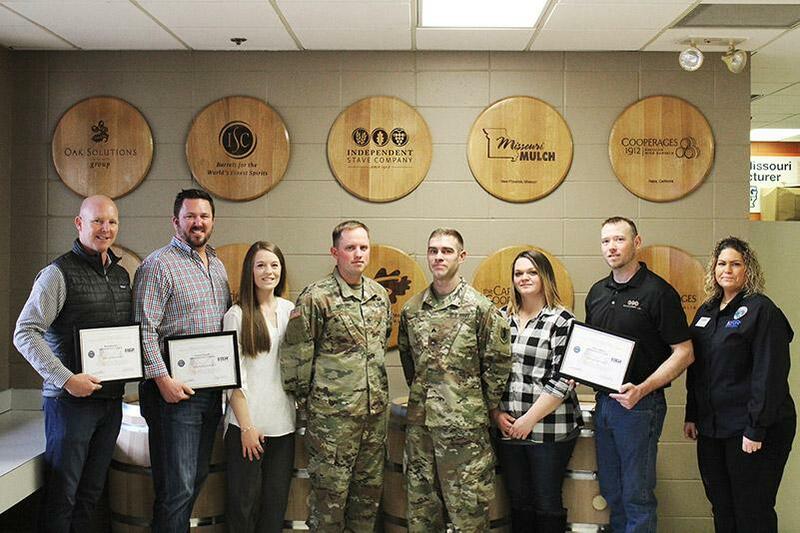 On Monday, February 4, 2019 three Independent Stave Company employees were honored to receive the Patriot Award by Employer Support of the Guard and Reserve (ESGR). The presentation was held at Missouri Cooperage. 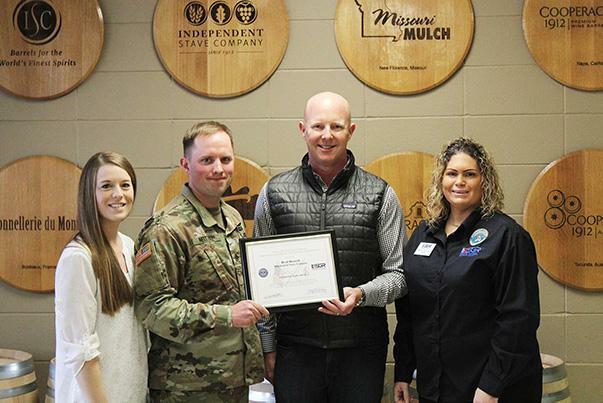 The Patriot Award reflects the efforts made to support citizen warriors through a wide-range of measures including flexible schedules, time off prior to and after deployment, caring for families, and granting leaves of absence if needed. Emil Neitzke, Western Log Auditor for ISCO and U.S. Soldier in the Army Reserve, nominated Garret Nowell, Director of Log Procurement. Independent Stave Company effectively supports my military obligation by allowing flexibility on when things are done and when I have to be certain places. This allows me the greatest chance of success both in the military and in the civilian world. Garret Nowell is highly supportive of my National Guard or Reserve service - even when I am called on short notice. Independent Stave Company continues my company benefits while I am on active duty and they even provided someone to fill in for me when I was away on annual training duty without penalizing me. Christina Neitzke, spouse of U.S. Soldier Emil Neitzke nominated Brad Boswell, CEO of ISCO. I have watched my husband flourish with Independent Stave Company over the last few years and what an honor it has been as his wife to see his company encourage, support and uplift his goals personally and professionally while he continues to serve our great country. 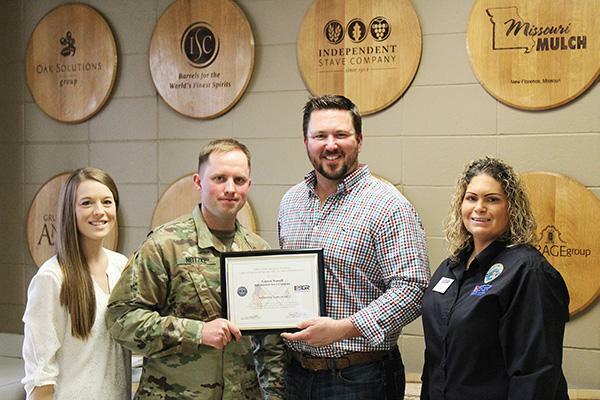 His continued dedication to this company has shown through their support throughout his commitment to the United States Army when he has to spend time away on monthly assignments and the occasional few weeks away from work and home. My husband is passionate, hardworking and dedicated to serving this great nation as well as this company and for that, I could not be more proud of him and the incredible company he works for. Ren Todd, Missouri Cooperage employee and U.S. 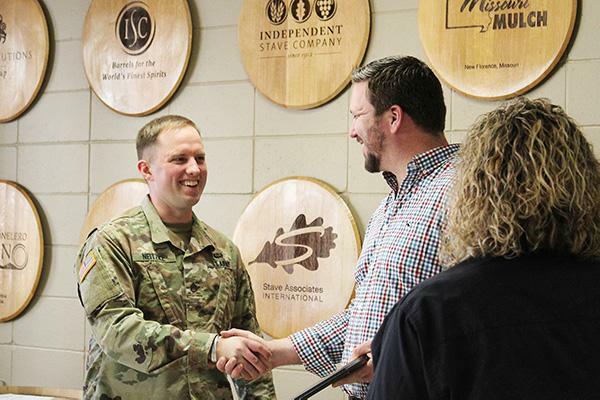 Soldier in the National Guard nominated his supervisor, Chris Adkins. Not only is my supervisor, Chris Adkins, supportive of my service, but my whole company supports me. My supervisor is a close friend and helps my family with anything they might need while I am gone on deployment. He even helps them while I am away for the two-week training during the summer. I couldn’t ask for a better supervisor to work under, or an organization to be a part of that supports my family and me while I am gone. I have been promoted in the organization even while I am away. Not because I am an army soldier, but because I am a hard worker. 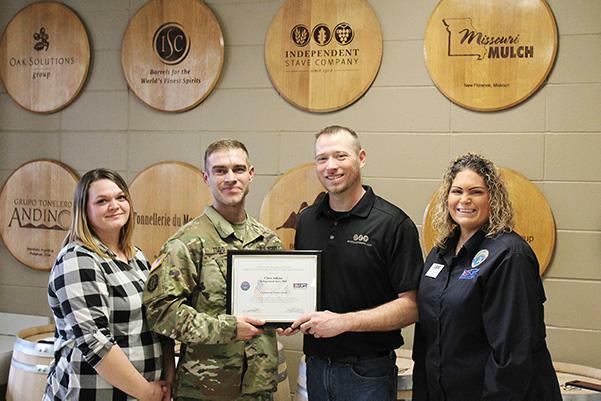 Left to Right: Brad Boswell, Garret Nowell, Christina Neitzke, Emil Neitzke, Ren Todd, Christian Todd, Chris Adkins, Marla McGowan - Area Chair, ESGR. To inquire about logos, photos, interviews, or other media requests please fill out our contact form.